Sonic the Hedgehog 50 is the groundbreaking fiftieth issue of the Sonic the Hedgehog comic. It is the fourth part of 4 issues of the Endgame saga. ...all of these memories are a part of a dream Robotnik is having, in his sleep chamber. The SWATbots monitoring him note that he must be having an exciting dream, but know that they need to wake him up. In the village itself, Tails and Rotor have been brought back to the surface for roboticization. Thinking that their lives are over, they hear something coming from above. Everybody looks up to see an airplane, followed by Sonic, Knuckles and Geoffrey charging down from the sky. Rotor is surprised to see all three of them working together, but this gives Tails the confidence to call out to everybody to band together. Drago orders the SWATbots to fire, but fail, as the trio take them down easily, along with numerous combots in the area. Tails, Rotor and Sonic then focus their attention on the roboticizer, destroying it and freeing the Knothole Mobians. After freeing the Mobians, Sonic looks over to Drago, who he instantly knows is the one who perpetrated his framing. He tries to escape, but Sonic enters into a spindash, chasing him down. He runs and runs, but Sonic is able to quickly catch up to him. Before he can do anything, a rock from an unknown source whacks Drago in the head, knocking him out. Sonic looks over to see Hershey the Cat, who stands over Drago in anger, claiming it was payback for making her kill Princess Sally. She explains to Sonic how she was tricked by Drago using Robotnik's technology, thinking she was cutting Snively off the rope, and not the Princess. She breaks down in tears, sorry for putting Sonic through everything, but Sonic has something else on his mind. He makes a fist and walks off to take care of some more business. Surely enough, this is true, as Robotnik is able to whack Sonic which his arm. As Sonic recovers, Robotnik presses a button on his command chair, activating the Ultimate Annihilator. With the lives of all those in Knothole on his shoulders, Sonic summons up more power than he ever has, launching himself at the Doctor and giving him a huge punch to the face. The punch sends him flying back into the console in the room, dazing him, but also malfunctioning the Ultimate Annihilator, with the destruction of the war room imminent. Despite knowing that the room will be destroyed at any time, the rivalry between the two makes them feel they have nothing to lose. Now, with all their anger, they focus their energies on each other. They exchange some of the most powerful punches that either have released, but despite the hits, their adrenaline keeps them going. This is the last issue to feature Robotnik Prime, although he will reappear in issue 108 and in numerous flashbacks/alternate realities. Rather than a hand-drawn cover, this issue features a computer generated cover design. This issue may have been named after the Star Trek: The Next Generation episode of the same name. Jules Hedgehog's name is first mentioned. Bean the Dynamite, Bark the Polar Bear, Ristar and Astal are shown in a quick shot of the Overlanders versus the Mobians. 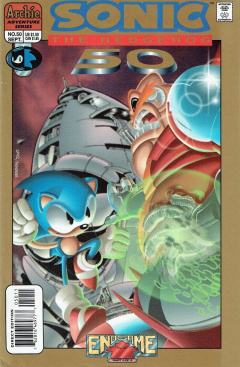 This issue has been considered non-canon due to how incomplete and rushed it was, so much in fact that Sega allowed Ken Penders to reprint the issue as a Sonic Super Special with their original vision.